As we previously discussed in Part I, returns-based style analysis, in particular MPI’s DSA model, generally does an excellent job of estimating the current equity exposures of Target Date Funds. In some cases, however, DSA estimates are significantly different from consolidated holdings information – for six fund families out of the current TDF universe, in fact. This by no means implies that DSA fails in some 10% of cases as one might hastily conclude. Rather, such discrepancies often provide the greatest insights. 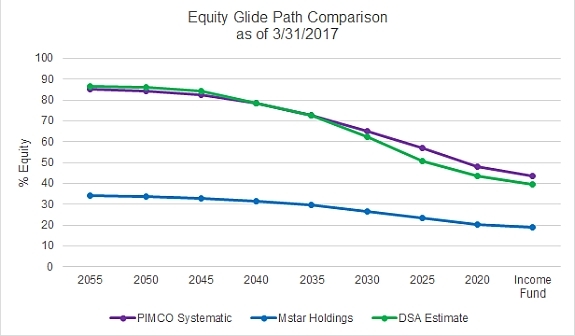 Let’s look at the largest discrepancy, highlighted in the chart below, which compares Morningstar database equity holdings to DSA equity estimates. This is the same chart as in the previous section, however in this case the outliers are not removed. 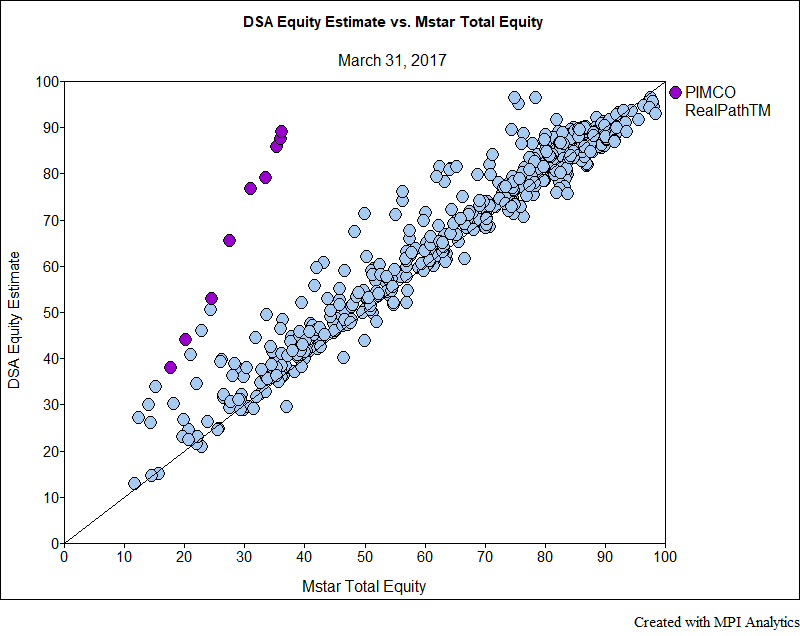 The largest outliers are the PIMCO Realpath™ Funds (highlighted in purple in the chart below). This extreme case is likely due to the fact that PIMCO uses derivatives to obtain much of its equity exposure. As these derivatives are not direct equity holdings, despite the fact that they are used to gain equity exposure, they are not classified as equity in the holdings tally. The actual dollar amounts in derivatives are captured but this naturally doesn’t fully reflect the behavior of the portfolio. MPI’s DSA however, estimates the effective mix of assets or factors that most closely replicate the funds’ performance and captures the systematic exposure of the funds. 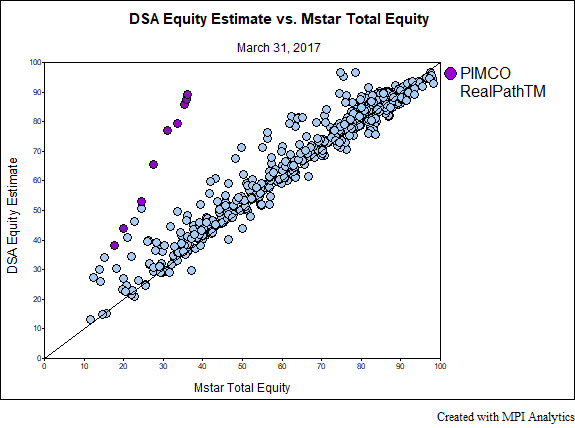 In the chart below we compare DSA Equity estimates to both reported Morningstar holdings and “Asset Allocation Market Value” reported by PIMCO, which appears to be their target effective market exposure. The largest equity holding is currently PIMCO’s StockPlus fund which tracks the S&P 500 with the use of futures, and the additional use of an “enhanced cash strategy”. The analyst gets two important pieces of information from noting and investigating this discrepancy. First, that PIMCO obtains some portion of its equity exposure through the use of derivatives and not direct investment. Of course, there are other ways to obtain the same information, not the least of which is reading the funds’ and sub-funds’ literature. Such analysis is, however, a very quick indication (without trolling through prospectuses or literally thousands of holdings) that this family takes a different approach from many others. The second piece of information is that the PIMCO series’ behavior is more or less in line with its intended exposures. The analyst then has the opportunity to compare the glide path to all other funds on the same behavioral basis as well as to consider the benefits of PIMCO’s approach and whether the derivatives-based exposure and active strategy may be appropriate for their clients’ portfolios. Four of the other five fund families with holdings vs. returns-based discrepancies are of a similar nature in that they have investments in derivatives, leveraged funds or absolute return funds, which affect the holdings tally. In each of these cases, DSA provides a much closer estimate to the intended systematic exposure. The final difference is Invesco’s line of target date funds that follows a risk-parity approach. 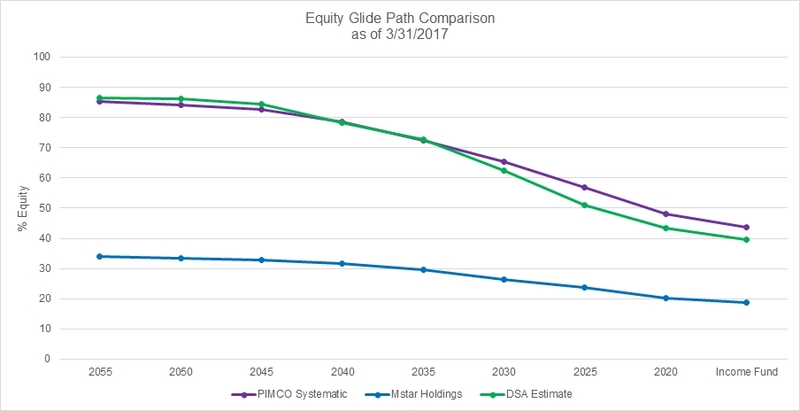 This fund series’ glide path cannot be reasonably compared to other target-date funds given the vast difference in philosophy and gross exposures. However, an unconstrained DSA analysis can provide insight into its exposures and evaluate it on a stand-alone basis. As various funds continue to diversify into alternative assets and make use of derivatives in their portfolios, the insights derived from RBSA approaches become increasingly valuable. Stay tuned for the third part in our Target-Date Fund Research Series in coming weeks.